A new campaign titled "Tweet from Prison," created by Dubai-based agency Tonic International, blends rehabilitation, recycling and social media into an unusual message. Italian fashion line Made in Carcere, founded in 2007, has always had a moral mission—helping incarcerated women better integrate into society after their release by teaching them to sew, using secondhand fabrics, while they're in prison. Now, the company also wants to help acclimate those women to the new technology that has become commonplace in the outside world … by turning the accessories they make into vehicles for social media communication. As the video below describes it, inmates can sew short (140-character or less) messages on bracelets, which are sold on the Made in Carcere e-commerce website. Consumers who buy them can respond to the messages by tweeting to the Made in Carcere handle with the hashtag #TweetFromAPrison. 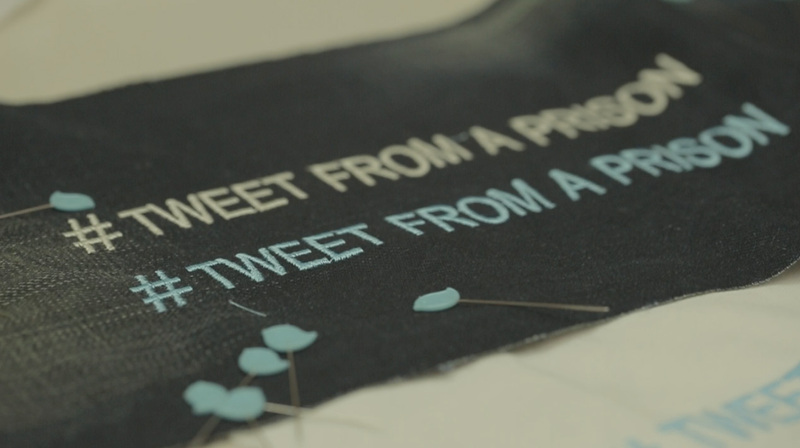 A special sewing machine prints those replies out in actual thread, so the workers can read the responses to their bracelet "tweets." The company joins a slew of marketers with recent ads featuring incarcerated criminals. In late March, a Polish PSA featured convicted murderers learning first aid to promote the Red Cross. At the same time, British detergent brand Persil released a spot filmed at a maximum security prison in Indiana, lamenting the fact that kids spend less time outside than inmates do. And two weeks ago, a road safety video for We Save Lives featured a drunk driver—currently serving 15 years for accidentally killing a cop—urging bar patrons through a bathroom mirror not to drink and drive. While these dire settings increase the emotional punch of all those messages, Made in Carcere's point differs substantially: It's tied directly to the company's business model, rather than a creative choice made just for impact (though arguably, that same choice was simply made far earlier in the business's life cycle). Regardless, its goal to provide job training and voluntary full-time employment to women imprisoned for minor offenses, while reducing waste by giving new life to unwanted textiles, is admirable—as is the desire to expose prisoners, at least conceptually, to the digital chatter that now defines modern life … and can make reintegration all the more daunting. How practical that latter target is, though, isn't entirely clear. Sewing 140 characters on a bracelet isn't quite the same as keeping up with the social media spew. But it's probably best to ease into the practice anyway (for anyone not planning to avoid it altogether, which might also be a reasonable approach). Receiving messages by sewing machine must be nice, in any case.